> PPP or commercial Financing? At this special reception at the Ministry of Foreign Affairs, ambassadors and regional representatives will get together with international experts from Austria, Russia and CEE states. Delegates will have the unique chance to meet and network with representatives of governments, leading European businesses, financial institutions, and the media in a relaxed atmosphere at Palais Festetics. Wissenschafts- und Technologiepark GmbH A-1220 Wien, Donau City Strasse 1. As the gateway to the East and the heart of Europe, Vienna symbolizes the European hub for high-level business contacts. Dr. Michael Häupl, mayor and governor of Vienna, will welcome the iconvienna VIP delegations and congress participants to a magnificent night at the prestigious City Hall of Vienna. 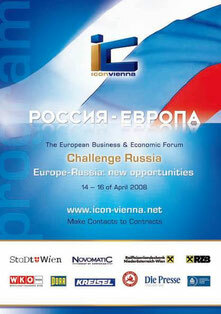 Be a part of this special event and combine business with entertainment at iconvienna 2008.